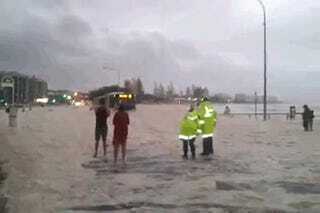 This is a foam-covered road in coastal Queensland, Australia. What you'll notice first is a bus braving the foam to get its passenger in the rig… OMG WHERE DID THAT CAR FROM? Everything in Australia is larger and scarier than anywhere else, including foam. We're just glad the two public servants standing near the edge of the foam weren't immediately killed. We're also glad someone posted a great GIF of it.